Whether you are an avid iPhone/iPad user, an Android fan, or a Blackberry aficionado, can the technology you use every day on your smartphone to complete such tasks as accessing email, surfing the web, and checking your agenda also be effective in helping you manage your health? Could this small, hand-held device that goes with you everywhere, stuffed inside a pocket, steer you through managing stress, your diet, your general health, or any related mental issues like anxiety, depression, and addiction? But wait a minute—shouldn’t you simply turn off all tools and unplug all electronics to smell the roses and “recharge your batteries,” so to speak? In a modern world that has embraced fast-paced technology as a necessity, it has now become difficult to take a “no electronics” stance when it comes to health and wellness. What has science got to say about health-related apps and tools? The general consensus seems to be that health apps and other interactive platforms are helping people on a per-case scenario. Depending on what your health issues are, there’s likely something out there that can help you. There are the obvious benefits of using apps that assist you to monitor your vital signs or general health. What if, for example, an expectant mother, worried about her baby, could be monitoring the heart rate of the fetus or intra-uterine contractions with a simple app? According to Eric Topol, a speaker at one of the TED Talks, “in the future, you will be checking your vital signs, your heart rhythm, your blood pressure, your oxygen, and your temperature” on portable devices. The medical sector is already doing this using something called AirStrip technology. This technology allows physicians to access a patient’s vitals, active meds, x-rays, and lab work results, all in one small device. Airstrip also allows doctors to access medical studies and drug databases. All of these different aspects of health monitoring can be uploaded simultaneously and integrated in ways that are making treatment decisions more efficient and more successful. As for patients themselves, Topol suggests that we could help reduce the need for hospital beds if we learned to check our own health. Using a device that monitors several vital signs that help show the risk of heart failure, for example, we could put preventative measures in place before reaching the point where a heart attack happens. In fact, you can have your own EEG at home. Some apps can currently help monitor your sleep. Others—with the help of sensors or small patches—can help monitor your heath by sending data to a physician and back to you, the patient. A clinic in Cleveland offers a stress meditation app that claims to enhance mental health and confidence. Other apps target healthy dieting, but without the expensive price tag associated with visits to the local weight loss clinic. Two popular apps, “Diet Tracker” and “Calorie Counter,” make it easy to scan, track, and calculate how many calories you have eaten. These apps also keep track of the nutrients in your diet. Vitamins, minerals, fats, and proteins can all be monitored and calculated by the apps. The app even creates a “motivation” report, telling you what goals you’ve reached and what successes you have had in sticking with your diet. 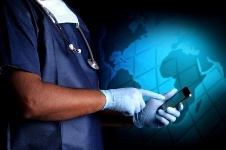 Perhaps the future of medicine lies in digital wireless devices. Topol, E., “The wireless future of medicine,” TED Talks website, http://www.ted.com/talks/eric_topol_the_wireless_future_of_medicine.html, last accessed May 15, 2013. Lappalainen, P., et al., “Feasibility of a Personal Health Technology-Based Psychological Intervention for Men with Stress and Mood Problems: Randomized Controlled Pilot Trial,” JMIR Res Protoc. January 2013; 2(1).